This post is sponsored by SunButter Sunflower Butter. All opinions are my own. Read our full disclosure here. It's that time of year again... back to school! 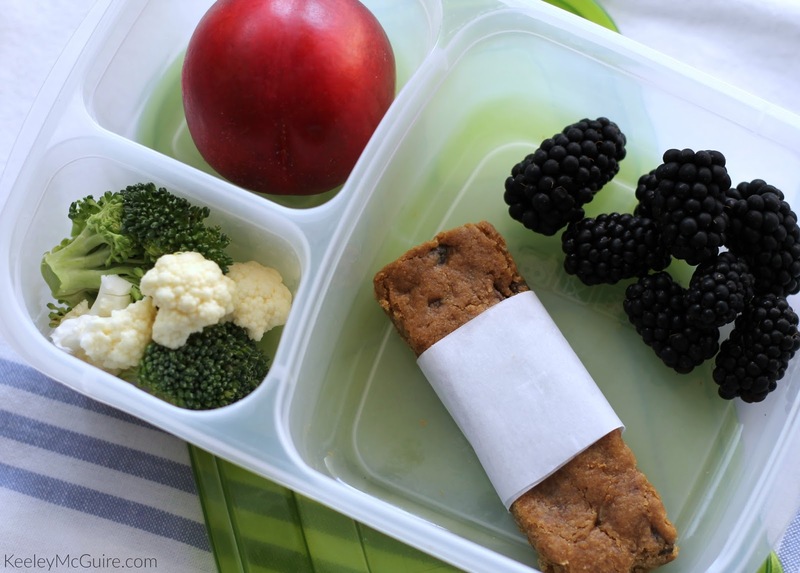 Time to get those lunch boxes ready. Little Miss started a school that follows a "balanced calendar" - meaning, she is on an almost "all year school" calendar and school began back on July 18th. Crazy, but it's let her start developing friendships right away, which is great. I'm always looking for simple lunchbox ideas and recipes that allow me to pack in protein and yummy allergy friendly ingredients she can enjoy at school. 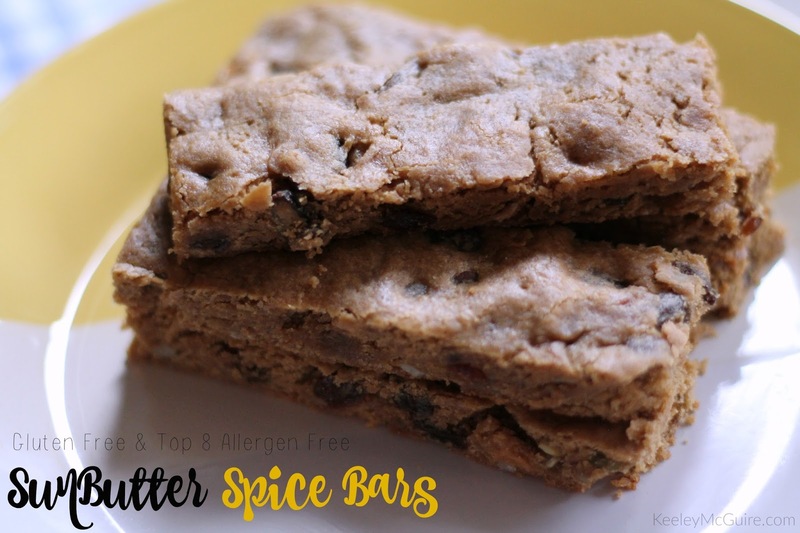 Just like these SunButter Spice Bars. They're gluten free and top 8 allergen free. It's been some adjusting because Little Miss started middle school this year. Thankfully, the school already had a lot of great plans in place for students with allergies and also regarding food in general. They have a dedicated peanut free table in the lunch room, for those who choose to sit there with peanut allergies and they do not allow homemade treats to be sent into school (outside of lunches and personal snacks). Everything has to be packaged with labels if it's going to be handed out to the class or shared among students. Of course for someone who loves to bake, like myself, that may not be a well received rule but in the end it helps keep the kids safe (for those with allergies and for health/ sanitary reasons). Thankfully, I can still get my "baking fix" with goodies in her school lunch and at home for desserts. 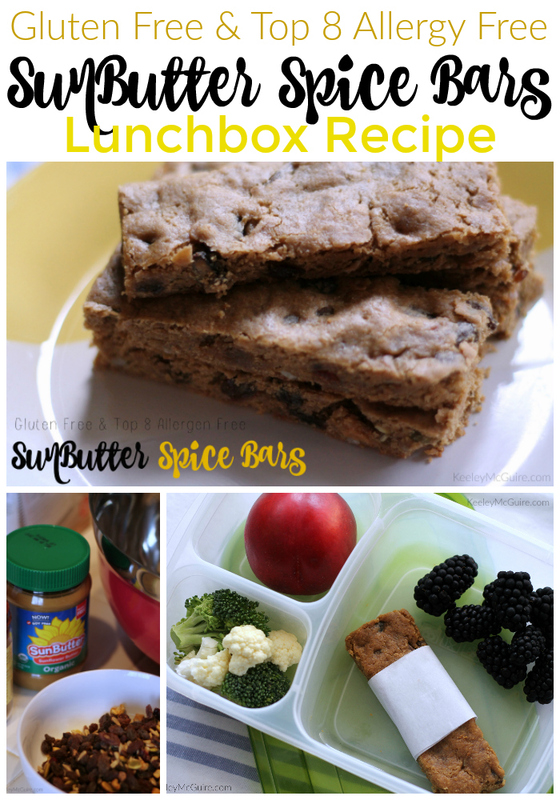 That's why these SunButter Spice Bars are so fantastic: They're easy to make and they can be cut into bars, squares, or even baked into cookie shapes instead to enjoy for lunches or snacks. Just bake, let cool completely, and slice with a pizza cutter. Then store in an airtight container for up to three days or freeze for up to three months. You could wrap them individually in wax paper so they're easy to pull a couple from the freezer and let thaw, as needed. The great thing about the bars are you can really choose your mix-ins. 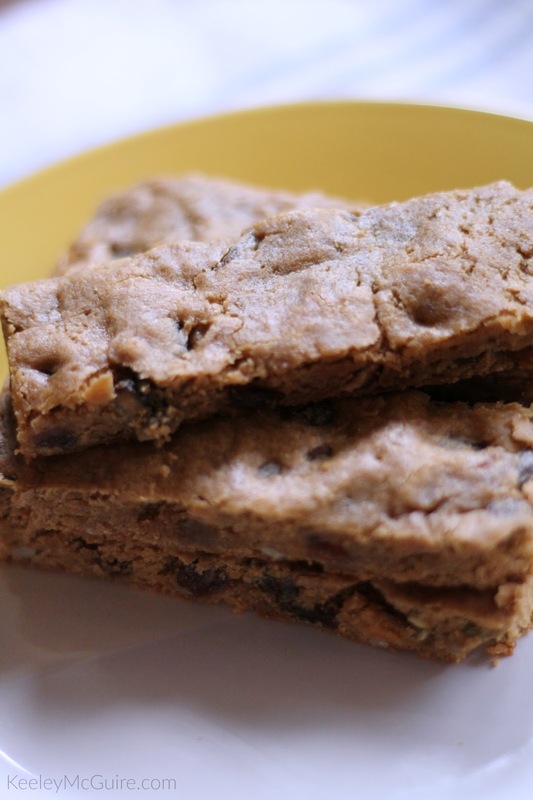 I use raisins + Enjoy Life Foods Mountain Mambo Seed & Fruit Mix. That way I get extra raisins, sunflower seeds, pumpkin seeds, some mini chocolate chips, and the dried apples are a nice play off the spices used in the batter. You could also use currants, golden raisins, chia or flax seeds, or possibly another chopped dried fruit, like apricots. The same goes for the puree used in the batter - I used applesauce, but you could try subbing pumpkin puree or banana instead for a different flavor combination. 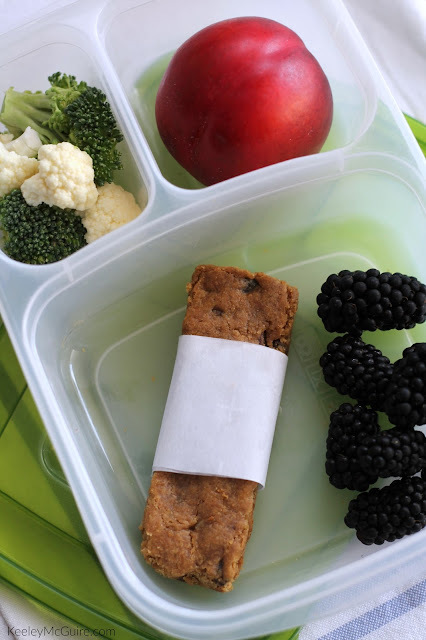 Pack them up for lunch and enjoy! 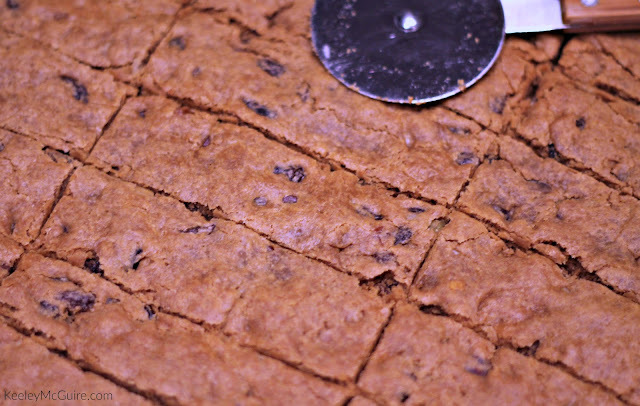 Prep: 20 Minutes Bake: 20-25 Minutes Yields: 18-24 Bars You don't need a professional mixer/ stand mixer for this recipe. Just a large bowl & silicone mixing spoon/ baking spatula. Preheat oven to 350 degrees. Line a 15.25x10.25" baking sheet with parchment paper and set aside. If your baking sheet is larger, that's okay, just know this is the approximate size you'll want to spread out your batter onto the sheet. In a large mixing bowl, combine the dry ingredients - gluten free flour, brown sugar, baking powder, baking soda, sea salt, all spice, cinnamon, & ginger - with your silicone baking spatula/ mixing spoon. Add the wet ingredients - SunButter, applesauce, honey, and vanilla extract. 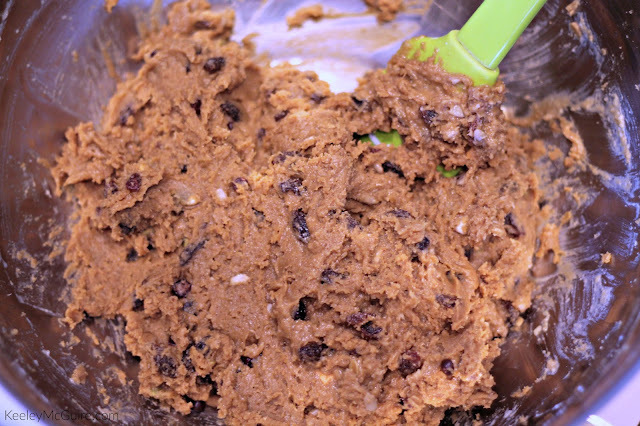 Stir into the dry ingredients just until it becomes moistened then fold in the 1 Cup of mix-ins. 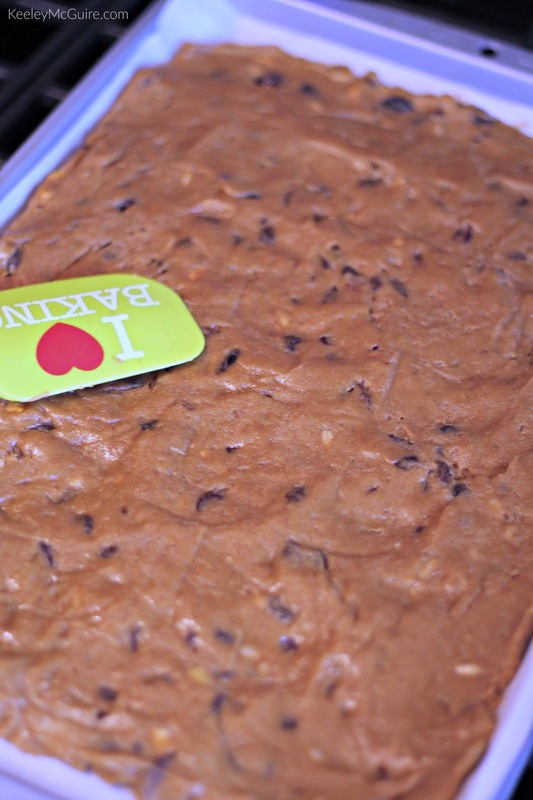 After batter is well combined, transfer the batter on the parchment lined baking sheet. Begin working the batter and spreading it out into a rectangular shape but using your silicone baking spatula/ mixing spoon. Keep it from completely touching the edges of the pan. Remove from oven and let cool on pan for five minutes before sliding parchment paper with baked bars off the pan and onto a cooling wire rack/ tray. Let cool complete, transfer to a cutting board, and slice with a pizza cutter. Store in an airtight container for up to three days or freeze for use later (see notes in post). This sounds delicious! 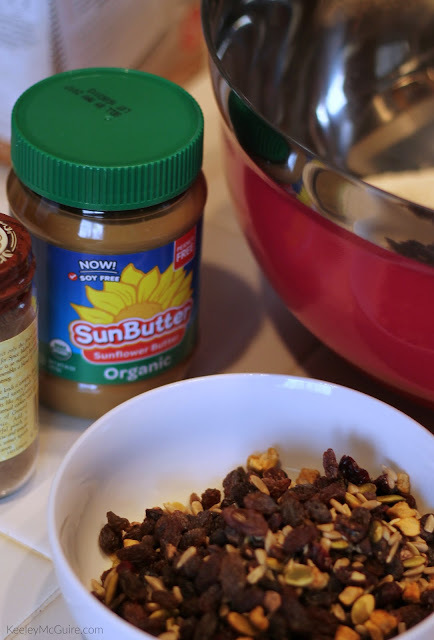 I love using sunbutter, and often substitute it for tahini in hummus. I'd like to try this!